Please don’t assume that putting a safety collar on your greyhound automatically makes your dog safe from escape. Any collar, regardless of style, is only as good as its adjustment. 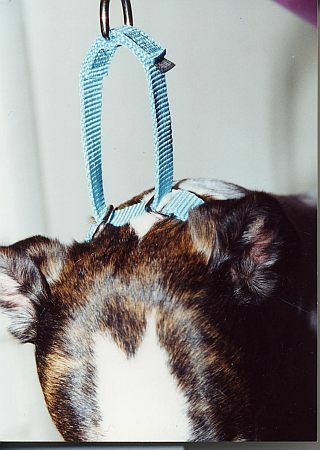 Consider the design of the safety collar (also referred to as humane choke or a martingale choke). It’s a two piece collar — a solid loop to which you attach the leash and an adjustable choke to which the closed martingale loop attaches through two metal rectangular pieces. Simply stated, if you adjust the collar by fitting it up high on your greyhound’s neck (behind his ears) and the two metal rectangles readily touch, you’re very apt to lose your shy dog in the next parade! The photo on the right shows Nikki’s collar improperly adjusted. To fit properly, the metal pieces must be closer to an inch apart when you’ve pulled really tightly on that martingale loop. The photo on the left illustrates Nikki’s properly-adjusted collar. Check the collar fit from time to time. They do stretch over time and need to be re-fitted. Remember: Greyhounds jump backwards when they’re frightened. Pull down on the leash for extra insurance if you see your dog getting frightened. 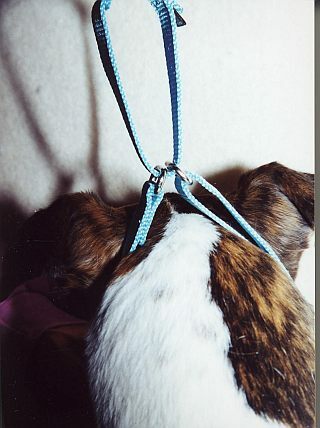 They can back right out of an incorrectly adjusted collar and you will be left holding a leash with no dog attached if you don’t pull down on the leash. A final to do: Attach your dog’s tags on any place other than the large D-ring. The D-ring is meant for the leash snap only. Tags attached to the D-ring can catch on hooks, knobs, and the like and have been known to cause strangulation. We strongly urge using a non-Martingale collar for tags; save the Martingale collars for leash walks only. The tag loop can get caught on knobs, crates, fences and other objects even if no tags are on the loop.